‘Dominator’ Michael Mansell tells the UFunClub/UToken troops that opponents of the program are like the disease-spreading zombies on ‘The Walking Dead’ television series. Source: YouTube promo dated May 4, 2015. 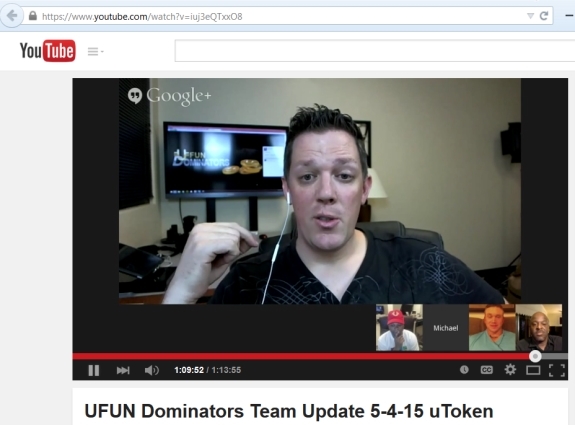 If you want to sell UFunClub/UToken, you have to understand that you’ll encounter opposition from “sheeples,” according to American promoter Michael Mansell of the UFUN Dominators Team. How to deal with the sheeples? Well, you bash their heads with baseball bats, he jokes. “You gotta push through those crowds of people,” he says in a 1:13:55 YouTube promo featuring three other American Dominators while UFunClub/UToken is under investigation in Thailand, where people are being arrested and property and assets are being seized. “I liken it to pushing through a bunch of zombies from ‘The Walking Dead.’ They’re gonna bite you; they’re gonna try to scratch you; they’re gonna try to infect you with their disease,” Mansell continues. There may be up to 3,000 Americans in UFunClub/UToken, even though there is no official office in the United States, according to the video. Precisely how so many Americans became involved remains unclear. If the 3,000 number is correct, however, it would mean that Americans potentially dumped more than $1.9 million into the cross-border scheme. Promoters advertised a minimum buy-in of $635. Buy-in sums of $1,230, $6,040, $12,100 and $57,500 also were advertised, meaning that American involvement in UFunClub/UToken could far exceed $1.9 million. Mansell was not advocating for actual violence against the purportedly brain-dead opposition; he was simply playing off a baseball-bat theme handed him by Rodney Burton, a fellow American Dominator. American MLMers/network marketers, Burton suggests, should be like slugger Babe Ruth: They should swing for the fences and not worry about fanning. After all, he says, people remember Ruth for his homeruns, not the number of times he whiffed. As for the American UFunClub/UToken Dominators? “We’re going to stand and keep on swinging until there’s no more bat left,” Burton says. He also contended during that call that UFunClub/UToken has an office in the United States that hasn’t opened. He didn’t say where, but claimed U.S. members would be able to fund their accounts through ACH transactions tied to an ewallet gateway. Which illegal scheme was that? Why, Rex Venture Group LLC, the operator of the cross-border Zeek Rewards scheme that ultimately gathered $897 million. Any UFunClub/UToken ACH vendor could be at the same risk. In the context of UFunClub/UToken, the risk even could be amplified. The case of TelexFree, an alleged $1.8 billion cross-border Ponzi- and pyramid scheme, may provide a strong clue. Records show that Brazilian regulators opened probes into its activities in that country in 2013. Any number of TelexFree promoters turned a blind eye to the Brazil developments and continued to promote the purported opportunity. U.S. regulators later charged several American TelexFree promoters with securities fraud. Records say that an American undercover agent for the U.S. Department of Homeland Security joined the TelexFree scheme under a promoter based in the United States. In other news from the Dominators’ video, American promoter Jamison Palmer was said to be back in the United States after promoting the scheme from Thailand. The “Preemptive Strike” tactic: accuse / denigrate your opponent first. Hitler was best known for it, having accused the Allies of being “warmongers” when he was the one pushing for confrontation. I think, and its just a thought, that US promoters might be doing the “balance transfer” method of converting their own Utokens they should know are now valueless into cash, by taking real money from the new suckers and transferring their own Utokens into newly created accounts. Gregg: that US promoters might be doing the “balance transfer” method of converting their own Utokens they should know are now valueless into cash, by taking real money from the new suckers and transferring their own Utokens into newly created accounts. Some of them also could have become money mules, as we saw in Profitable Sunrise and Imperia Invest: gathering funds directly from recruits, depositing it in a shell-company account and then wiring it to a specified account.